In the 1950’s Weber essentially made their name in the grill industry with the popularity of their classic 22-inch charcoal kettle grill. At that time, outdoor grilling was becoming increasingly popular, yet most homes either didn’t have a grill, or they had some improvised setup of bricks and rusty metal. 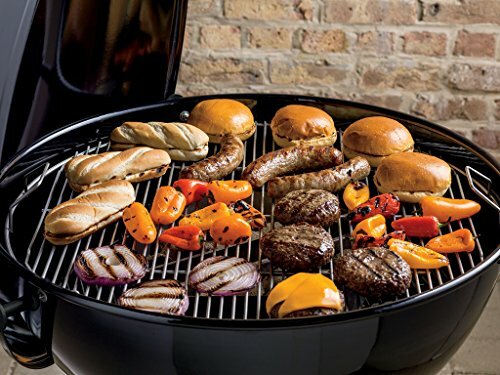 The Weber 22-inch grill did very well for itself and to this day it remains a popular option. Yet some backyard grill masters find it to be a little on the small side, and sometimes even a little too basic. 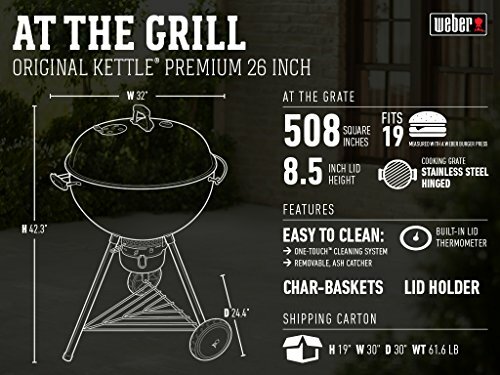 Recognizing that there was a need for a next step up, Weber has developed their 16401001 26-inch Kettle Premium Charcoal Grill, which does more than just provide you with additional 145 square inches of grilling space. Weber also made a point to design it with some advanced features. 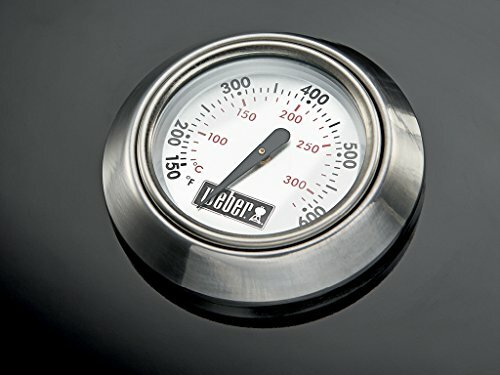 The Weber 16401001 Original Kettle Premium Charcoal Grill was designed with a thermometer built into the lid to allow you to monitor in the grill’s internal temperature. 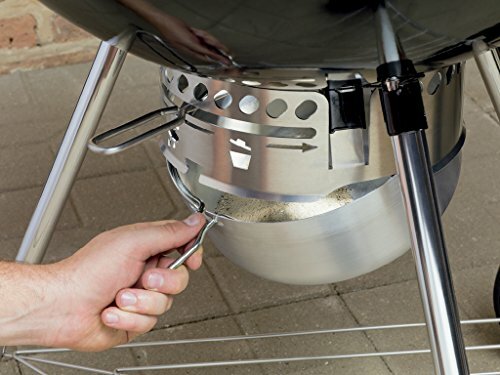 The kettle also has a tuck away lid holder to help hold the lid in place while you are tending to the food, without the precarious lid hook that you get with the 22-inch kettle grill. The grill grate also hinges, to allow you better access to the coal bed. This can be very helpful if you want to reload more charcoal or wood chips. 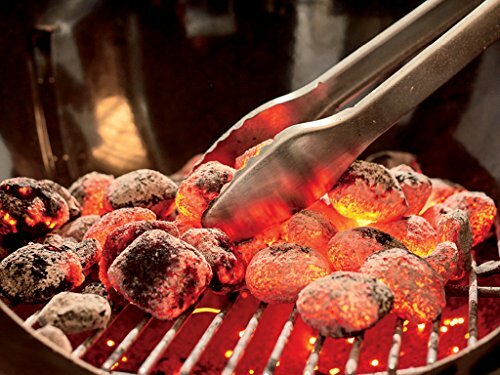 With some careful placement of the charcoal you can even use the grill for slow and low application, like smoking a single pork shoulder or a small brisket. The lid also includes a rust-resistant aluminum damper, which allows you to adjust the airflow for better heat control. It also works in conjunction with the bottom damper which not only helps regulate air, but it can also help deposit ash into the lower ash can, for easier cleanup. 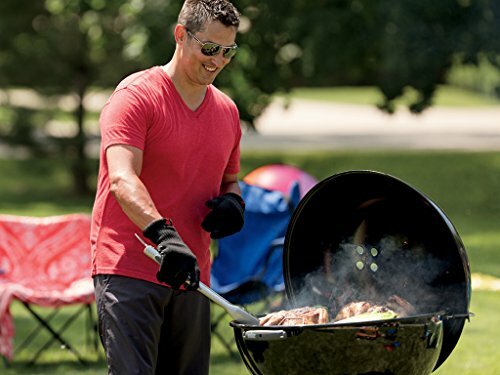 The Weber 16401001 Original Kettle Premium Charcoal Grill has glass reinforced nylon handles that make it easier to grip the grill if you need to move it. The lid handle also helps you comfortably hold it without burning your hands. 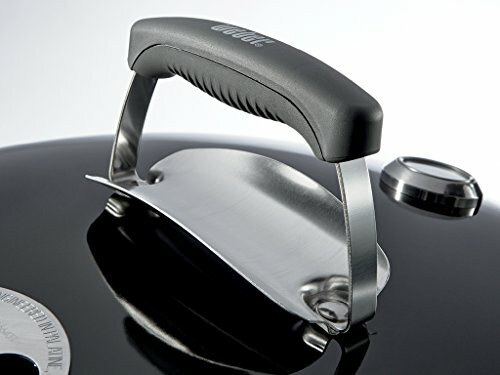 The side handle also includes a pair of tool hooks to help hold a pair of tongs, or spatula. 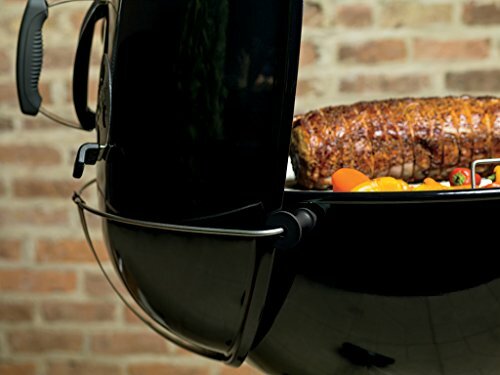 Weber typically prides itself on using quality materials. The lid and bowl are porcelain-enameled for a sleek black look, as well as superior rust resistance. The hinged grate is made from stainless steel. 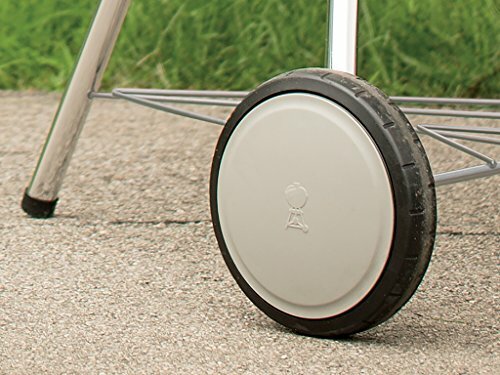 The glass reinforced handles are coated with a special heat-resistant nylon material. 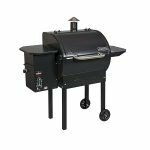 The Weber 16401001 26-inch Original Kettle Premium Charcoal Grill is relatively easy to assemble. With a few basic tools, you should be able to completely assemble it in around half an hour. If you are not mechanically inclined there are some online retailers who offer an expert assembly service. 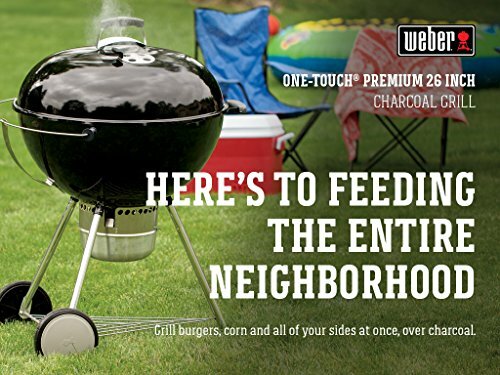 The Weber 16401001 26-inch Original Kettle Charcoal Grill can handle a large number of burgers, hot dogs, steaks, and chicken breasts. If you would like to try your hand at slow and low smoking or classic barbecue, there is enough space in the bowl for a modest charcoal fire on one side, and enough room on the grate to place a pork shoulder, rack of ribs, or even a small brisket. The hinged grate also allows you easy access to reload charcoal or wood chips. The top and bottom dampers can be set to allow enough oxygen for the fire to roar. If you prefer you can dial them down to nearly smolder the fire to mimic a charcoal smoker. In general, the bottom damper will have more of an effect on how hot the fire gets, and the upper damper helps you control how much heat and smoke remains trapped under the lid. 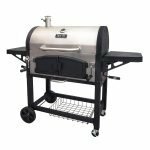 On paper, the Weber 16401001 26-inch Original Kettle Premium Charcoal Grill is only four inches larger than the classic 22-inch. However, this translates into 508 square inches. 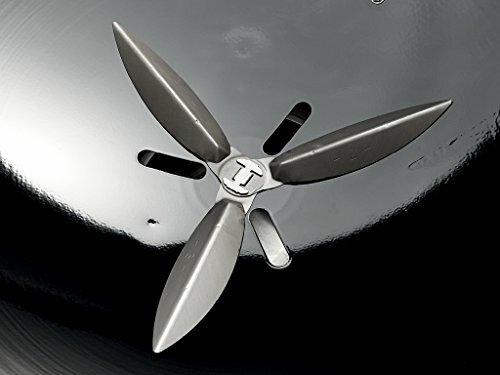 The stainless steel grate is hinged, which allows you to reload the bowl with more charcoal or wood chips. 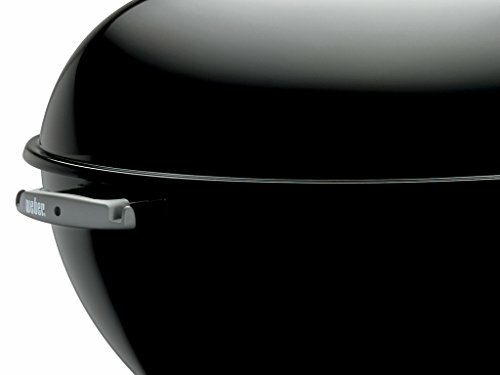 The bottom of the Weber 16401001 26-inch Original Kettle Premium Charcoal Grill also stands apart from other kettle-style grills. The damper itself can be moved back and forth to release spent ash and cold embers. They are then deposited into the integrated ash can. Not only does this help with cleanup, but it also prevents stray embers from escaping while you grill. 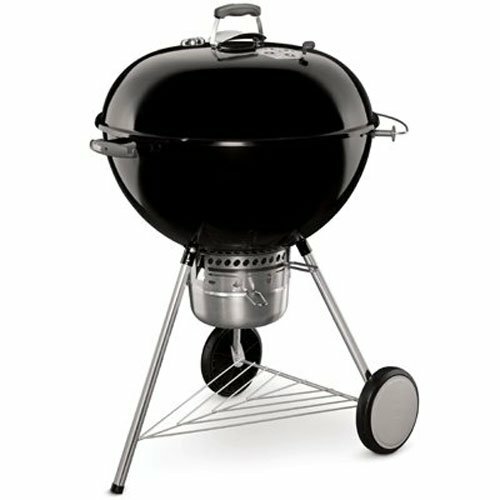 The Weber 16401001 26-inch Original Kettle Premium Charcoal Grill is relatively easy to clean. The bottom damper is integrated into a One-Touch™ cleaning system. It can be adjusted to release ash and embers. Just make sure the fire is completely out. The ash can is designed to hold a decent amount of ash, from an average grilling session. If you want to multi-task the Weber 16401001 26-inch Kettle Grill for smoking or barbecue, there might be too much ash for the built-in can. In a situation like this, you should deposit the first load of ash into a metal bucket, then stir in a little water to ensure that the fire is completely out. You should never pour water into the bowl of the grill or the ash can, as wet ash promotes corrosion. 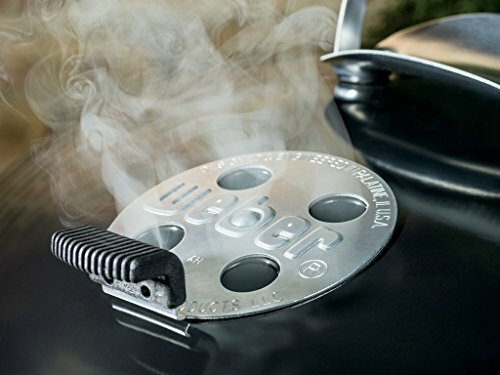 Weber provides a multi-tier limited warranty for their 26-inch Kettle Grill. The Bowl, lid, and center ring have a 10-years, no rust through/burn through warranty. The One-Touch™ cleaning system and plastic components have a 5-year, no rust through/burn through warranty which excludes fading or discoloration. All other parts and components have a 2-year warranty. 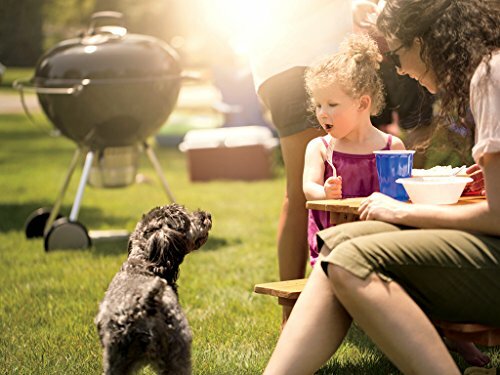 The Weber 16401001 26-inch Original Kettle Premium Charcoal Grill takes a step up from all other kettle grills, by adding intuitive features to their classic design.